Another action packed and thrilling week for the students and volunteers of Sekolah Gunung Merapi. This week we celebrate our 500th book loan from our library! With more and more of our students learning the value of reading and understanding the joy of being absorbed in a book, we look forward to paving the way towards our 1000th book loan. Our library is not just a place where books can open new worlds and broaden horizons for our users but a social hub, a place where people can feel free, be creative and be part of a community. Our school is proud to put the community at the heart of all that we do. 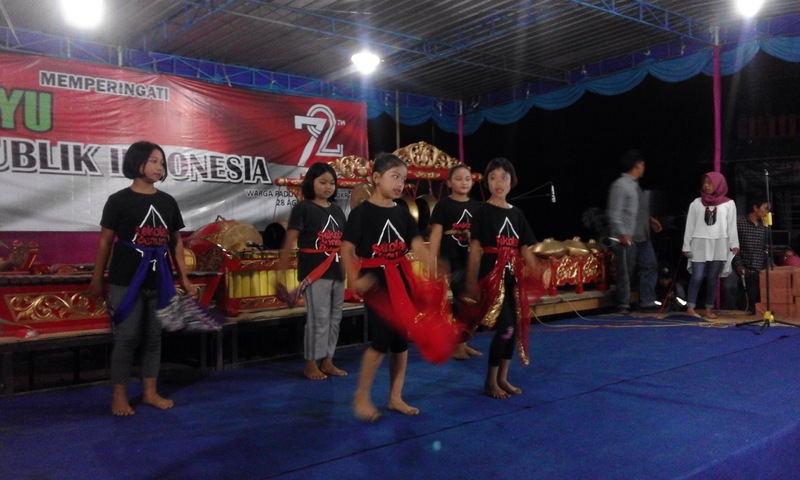 On Monday, students performed at a village dance show to mark the end of Independence Day celebrations. 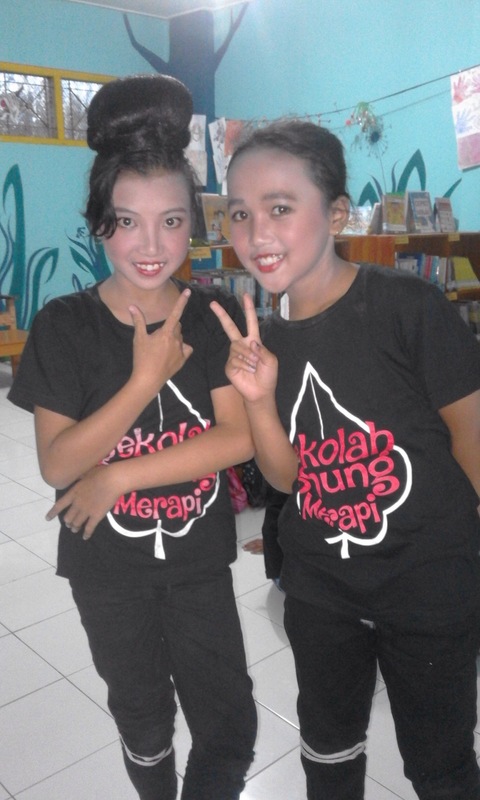 Proudly wearing their Sekolah Gunung Merapi t-shirts, the students performed brilliantly and were a real credit to the school. Getting children involved in events like this is a great way of engaging them with our history, build pride for their country and understand that by understanding the past, we build for the future. Back stage: Our students get ready for the show. Opening the show: our youngest dance students perform their piece entitled ‘Indonesia Menari’. This week also saw the start of the new term for the school’s dance classes. In an exciting new development and for the benefit of our students, this term the teaching content will be broadened to include all performing arts! Our incredible teachers Endah and Abi will guide the students in skills such as music, drama, musical theatre and magic. These activities are crucial for encouraging students to develop their creativity, team work skills and boost their self-esteem and confidence. These are abilities which will be invaluable to them in adult life, whatever life path they should choose to follow. There is only so much a child can learn from a textbook; we hope that these classes will help our students flourish, become innovators and have fun! The school hopes to put on an end of term show, which the students will collaborate to write and perform in. Let’s get physical! 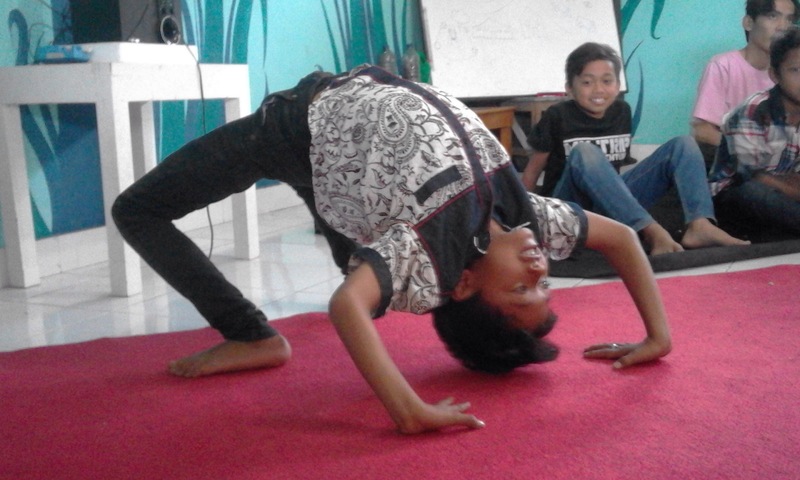 Mas Abi guides our young students through a series of exciting physical and vocal warmups. In search of serenity: Mbak Endah guides the students through a range of visualisation and meditation exercises. At the school this week we will be marking Idul Adha. The kind students of Universitas Islam Indonesia will be volunteering this weekend to help with repairs to our water system and electricity. There are plans for games and a sharing workshop. Most importantly though is that our lovely volunteers will teach the children the value of assisting others, generosity and selflessness. The children are looking forward to welcoming them. That’s all for this week? Why not set up a reminder to check out our weekly updates? We can promise inspiration, joy and more lust for learning! Thanks for watching our school grow! ← New term at SGM begins: Nine classes and 65 students! → This week at Sekolah Gunung Merapi: a visit from UII’s Excellent Community, IT classes and so much more!